Blue/green deployments provide near zero-downtime release and rollback capabilities. Blue environment represents the current application version serving production traffic. In parallel, the green environment is staged running a different version of your application. After the green environment is ready and tested, production traffic is redirected from blue to green. If any problems are identified, you can roll back by reverting traffic back to the blue environment. 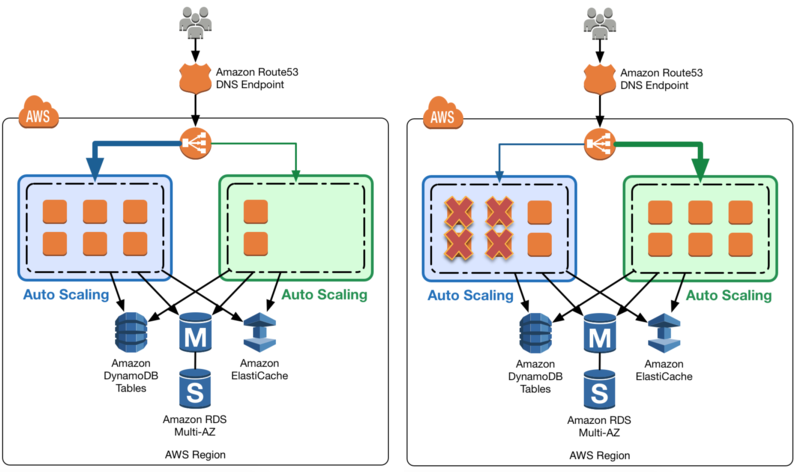 Elastic Load Balancing scales in response to incoming requests, performs health checking against Amazon EC2 resources, and naturally integrates with other AWS tools, such as Auto Scaling. 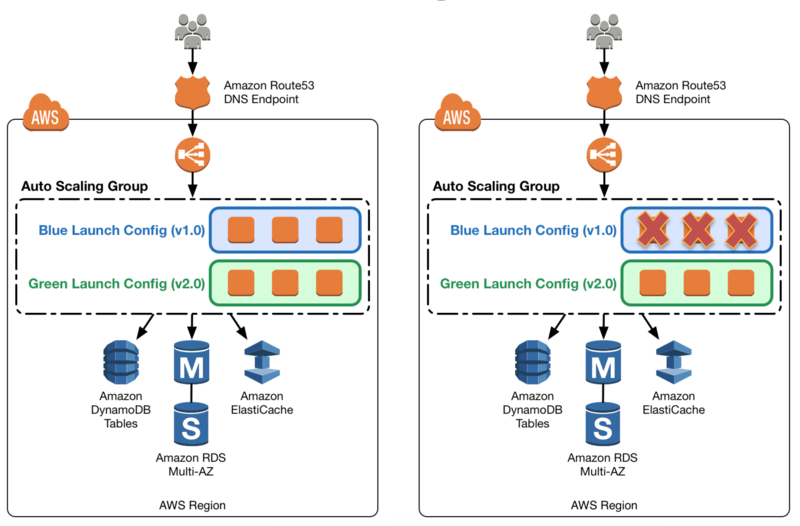 Auto Scaling allows different versions of launch configuration, which define templates used to launch EC2 instances, to be attached to an Auto Scaling group to enable blue/green deployment. Termination policies in Auto Scaling groups to determine which EC2 instances to remove during a scaling action. 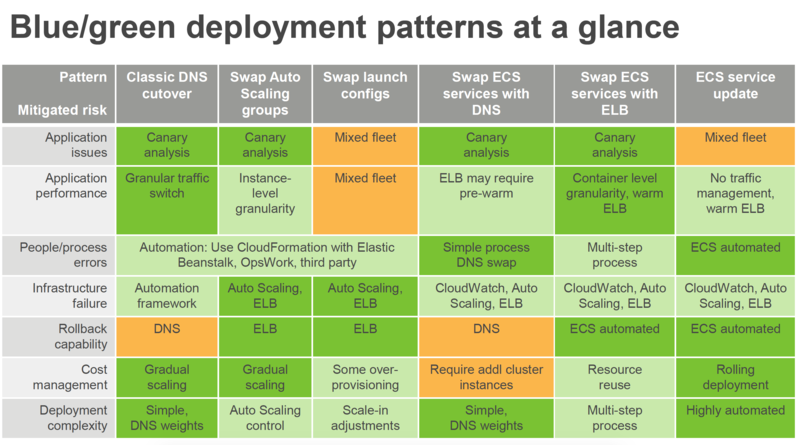 Elastic Beanstalk makes it easy to run multiple versions of the application and provides capabilities to swap the environment URLs, facilitating blue/green deployment. Stacks are made of one or more layers with each layer represents a set of EC2 instances that serve a particular purpose, such as serving applications or hosting a database server. OpsWorks simplifies cloning entire stacks when preparing for blue/green environments. Route 53 can handle Public or Elastic IP address, Elastic Load Balancer, Elastic Beanstalk environment web tiers etc. After a new launch configuration is in place, any new instances that are launched use the new launch configuration parameters, but existing instances are not affected. To deploy the new version of the application in the green environment, update the Auto Scaling group with the new launch configuration, and then scale the Auto Scaling group to twice its original size. Elastic Beanstalk provides several deployment policies, ranging from policies that perform an in-place update on existing instances, to immutable deployment using a set of new instances. Elastic Beanstalk performs an in-place update when the application versions are updated, however application may become unavailable to users for a short period of time. To perform a rollback, invoke Swap Environment URL again. The ability to change server counts. Updating a server after creation. The inability to change server counts. 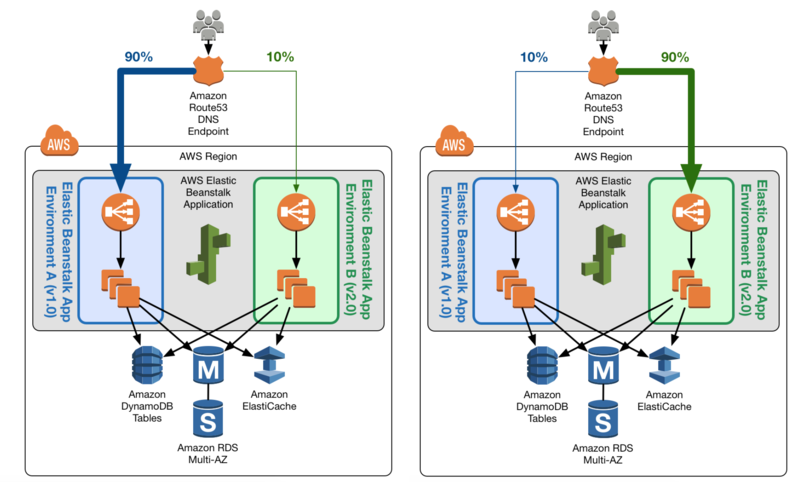 Migrate to use AWS Elastic Beanstalk. Use the established and well-tested Rolling Deployment setting AWS provides on the new Application Environment, publishing a zip bundle of the new code and adjusting the wait period to spread the deployment over time. Re-deploy the old code bundle to rollback if needed. When thinking of AWS Elastic Beanstalk, the ‘Swap Environment URLs’ feature most directly aids in what? You were just hired as a DevOps Engineer for a startup. Your startup uses AWS for 100% of their infrastructure. They currently have no automation at all for deployment, and they have had many failures while trying to deploy to production. The company has told you deployment process risk mitigation is the most important thing now, and you have a lot of budget for tools and AWS resources. 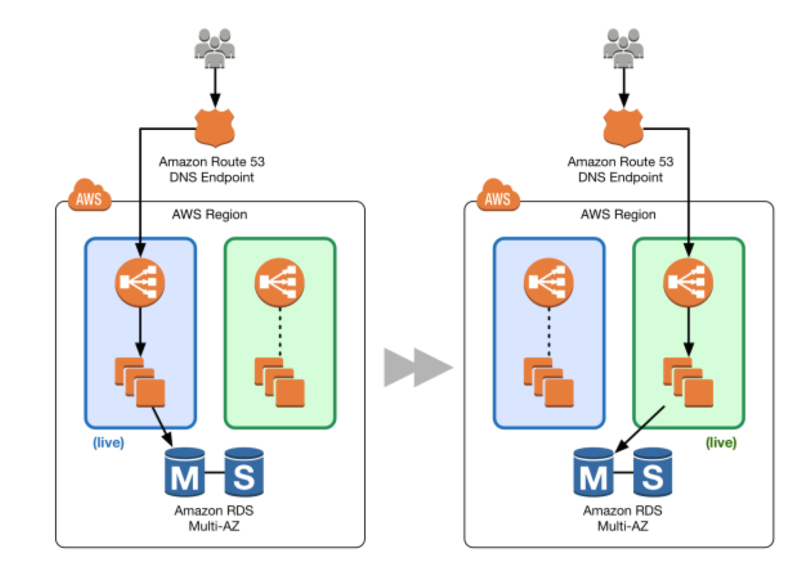 Their stack: 2-tier API Data stored in DynamoDB or S3, depending on type, Compute layer is EC2 in Auto Scaling Groups, They use Route53 for DNS pointing to an ELB, An ELB balances load across the EC2 instances. The scaling group properly varies between 4 and 12 EC2 servers. Which of the following approaches, given this company’s stack and their priorities, best meets the company’s needs? Model the stack in 3 CloudFormation templates: Data layer, compute layer, and networking layer. Write stack deployment and integration testing automation following Blue-Green methodologies. You are building out a layer in a software stack on AWS that needs to be able to scale out to react to increased demand as fast as possible. You are running the code on EC2 instances in an Auto Scaling Group behind an ELB. Which application code deployment method should you use? Specify the latest Amazon Linux AMI as a custom AMI at the stack level, terminate instances of the stack and let AWS OpsWorks launch new instances with the new AMI. Thanks a lot for your blogs which helps me understood AWS services in detail. And complete my AWS solution architect certification.